Situated close to Lake Geneva, Bernex, in the Chablais region, offers traditional villages, stunning scenery and a wealth of things to do. In the winter Bernex offers its own ski area of 50 km, between 1000 and 2000 metres, with a variety of runs to suit all levels and also breathtaking views of Lake Geneva and Mont Blanc . It also boasts 34 snow canons with their own water reservoir. 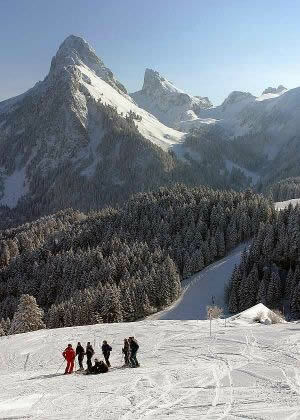 Winter walking and cross country skiing are further activities that the Bernex valley, plateau du Gavot, has to offer, together with sleigh rides and sledging. Whilst Bernex offers sufficient skiing, there is also Thollon les Memises 10 minutes away, together with La Chapelle d’Abondance, under 30 minutes away which is linked to the vast Portes du Soleil ski area. In summer, Bernex offers plenty of activities – tennis, petanque, horse riding, mountain biking, parapente, fishing and rafting, together with recreational and cultural activities. With nearby golf, sailing, swimming, climbing, paragliding, white-water rafting and canyoning at Lake de la Beunaz, and the famous Dent d’Oche at 2222 metres high for those keen for a challenge. For those less adventurous there are many rambling paths which accommodate all levels. Lake Geneva and Evian are 15 minutes away, with water sports, spa & thermal baths, beaches and bars to give you that waterside feel. There is a local distillery in Bernex which you can visit and sample local products. Alternatively, just sit back, relax and enjoy the views and atmosphere of this naturally beautiful area. parapenting, winter-walking trails, cross country skiing, sleigh rides. tennis, mountain biking, walking, parapenting, climbing, watersports. walking, husky rides. With a car, it is possible to visit more of local area - Geneva, Evian, Yvoire, or slightly further afield to Annecy and Chamonix.